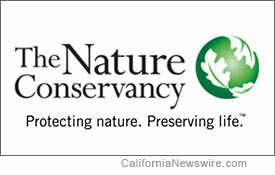 WATSONVILLE, Calif. /California Newswire/ — The Nature Conservancy today transferred ownership of the majority of their Elkhorn Slough land holdings (750 acres) to the Elkhorn Slough Foundation for continued conservation management. This is the largest single transfer of conservation lands in history of Elkhorn Slough and cements the Elkhorn Slough Foundation as a significant conservation leader and land trust in the central bay area. “The collaboration that evolved from the Conservancy and Elkhorn Slough Foundation’s efforts are a model of cooperative conservation, tackling 21st Century issues including large-scale estuary management, restoration, and climate change,” said Laura Smith, The Nature Conservancy, Central Coast Project Manager. Elkhorn Slough is an estuary – where fresh water meets salt water – which stretches seven miles inland from Monterey Bay. The mouth of the slough opens to the head of the Monterey Submarine Canyon – the deepest oceanic trench along the Pacific coast. This is one of the few places anywhere in the world where in the span of five miles you can go from rare maritime chaparral on rocky ridgetops to the deep sea. It is home to a rich array of wildlife and plants, and has been designated a Globally Important Bird Area by the National Audubon Society and the American Birding Conservancy. The largest concentration of Southern sea otters resides in the lower reaches of the slough and oak woodlands crown the surrounding hillsides. Elkhorn Slough is also one of California’s few remaining tidal wetlands, one of the most productive habitats in the world. But these coastal environments are also among the most endangered. In California, nearly 90% have been destroyed. In 1971, to protect Elkhorn Slough from major development, The Nature Conservancy purchased the first wetlands there for conservation. Public and private partners continued to acquire wetland and upland areas leading to the designation of the Elkhorn Slough National Estuarine Research Reserve in 1979. Prior to this current transfer, the Conservancy owned over 850 acres in the Elkhorn Slough watershed. The Elkhorn Slough Foundation provided on-site management of those lands along with their ownership of 2,800 acres. The Elkhorn Slough Reserve, managed by the California Department of Fish and Game in cooperation with the National Oceanic and Atmospheric Administration, protects 1,740 acres, and another 728 acres are conserved as the State Moss Landing Wildlife Area. Other conservation lands are managed by the Department of Parks and Recreation, the Moss Landing Harbor District and the Monterey County Parks Department. These combined efforts have conserved over 6,000 acres of key properties in the Elkhorn watershed. Relatively undeveloped, large landscapes, like the Elkhorn Slough watershed which reaches from the uplands to the coast, promote healthy wildlife by allowing movement and adaptation over wide areas. Elkhorn Slough offers inspiring educational and recreational opportunities and attracts tens of thousands of visitors each year. In addition, students of all ages experience and connect with the natural world through an array of popular educational programs, such as the Elkhorn Slough Reserve’s Coastal Training Program and K-12 school programs. With active community support, the Elkhorn Slough Reserve Volunteer program has contributed thousands of hours to slough conservation. From The Conservancy’s early efforts to conserve tracts of land to the establishment of the Elkhorn Slough Reserve and the rise of the Elkhorn Slough Foundation as a strong local land trust, these efforts reflect the evolution of conservation on the central coast. Today, Elkhorn Slough is a hub of cutting-edge conservation research, outdoor education, and public access for recreation.